On April 12, the County Commission rejected an initiative to charge for the rides on the Metromover. It will continue free, but this is an issue that keeps coming back. 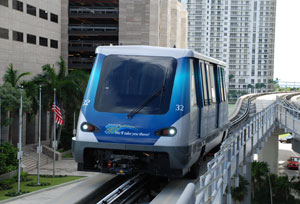 Commissioners asked voters in 2002 to approve a half-percent sales tax increase for local transit that year and they promised to keep the Metromover free. Since then, they kept their promise. Miami-Dade County Commissioner Barbara Jordan presented the initiative to charge for the rides. She argued that lower-income passengers that pay $2.25 to ride the bus system in Miami-Dade are subsidizing affluent downtowners. County Mayor Gimenez stressed -among other reasons- that voters were promised the free rides when they voted to raise the sales tax in 2002, and that the county should keep up its end of the bargain. According to Mayor Gimenez, Miami-Dade will spend nearly $533 million this year operating its transit system. If the fee were $1.00 the county would collect around one million a year from the Metromover. However, it would cost $9 million just to install fare collection equipment plus more personnel would also be needed. To pretend that because new luxury condominiums have been built downtown it is now affluent residents who ride the Metromover, it is just ignoring that it is mostly workers, students and tourists riding it. Charging will encourage driving. Income from the Metromover will be less and traffic worse. Was Commissioner Barbara Jordan ready to lower the sales tax that was raised in exchange for the free Metromover? For now, the Metromover stays free, and Commissioners Barbara Jordan and Bruno Barreiro will meet to discuss the possibility of making Metrobus and Metrorail also free of charge.